I know we are supp osed to be well into spring by now, but the snow we had today makes me question the calendar. 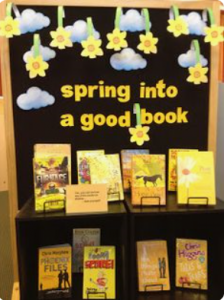 Put the words “Spring Into a Good Book” on a bulletin board and surround it with yellow spring flowers (daffodils) and then put books with bright yellow covers in front of it. Here are 10 more program and display ideas for May. Use this month to encourage kids to always have a book on hand. Hand out small prizes throughout the month for catching students making the choice to read for fun throughout the school day. Check out Action for Healthy Kids for ideas on how to partner with schools to celebrate health and fitness in your community. Brought to you by the Oral Health Foundation, this celebration can be a much about dental hygiene as it is about enjoying sharing a smile with a friend. Post pictures of children sharing their silliest faces, and best smiles, on a bulletin board. May the Fourth be with you! (Get it?) There are lots of great resources available on the official Star Wars website http://www.starwars.com/may-the-4th for celebrating but be wary because tomorrow is Revenge of the Fifth (Sith)! Try your hand at penning a limerick or use thee resources from KidZone Poetry http://www.kidzone.ws/poetry/limerick.htm to help your young patrons get the form just right. Remember the jumping frog contest from Mark Twain’s “The Celebrated Jumping Frog of Calaveras County”? Did you know Calaveras County is a real place? And has a real frog jumping contest every May? For the full schedule of events, go to https://www.frogtown.org/. Visit the World Wildlife Fund’s website https://www.worldwildlife.org/ to read about currently endangered species. Prepare a display of your children’s non-fiction books that are about those species. Leave pennies throughout your library throughout the day for patrons to find. As a person finds one, wish them a day of good luck. Check out the amazing database of paper airplanes from Fold N Fly www.foldnfly.com/ and challenge your patrons to a flying competition with awards for longest distance, best trick flying, and best airplane design. Andrew Clements is an American writer of many children’s books. His debut novel, Frindle, won annual book awards determined by the vote of U.S. schoolchildren in about twenty different U.S. states. Display all of Andrew Clements books with a sign commemorating his birthday. For more display ideas, be sure to follow me on Pinterest.